Considering the fact that I’m a dietitian and a pretty avid label checker I was both amazed at the number of ingredients in these coconut milks and ashamed that I was only just figuring this out after many years of grocery shopping. I also figured that there must be others like me who had never considered the possibility that coconut milk would consist of anything other than, well, coconut milk. 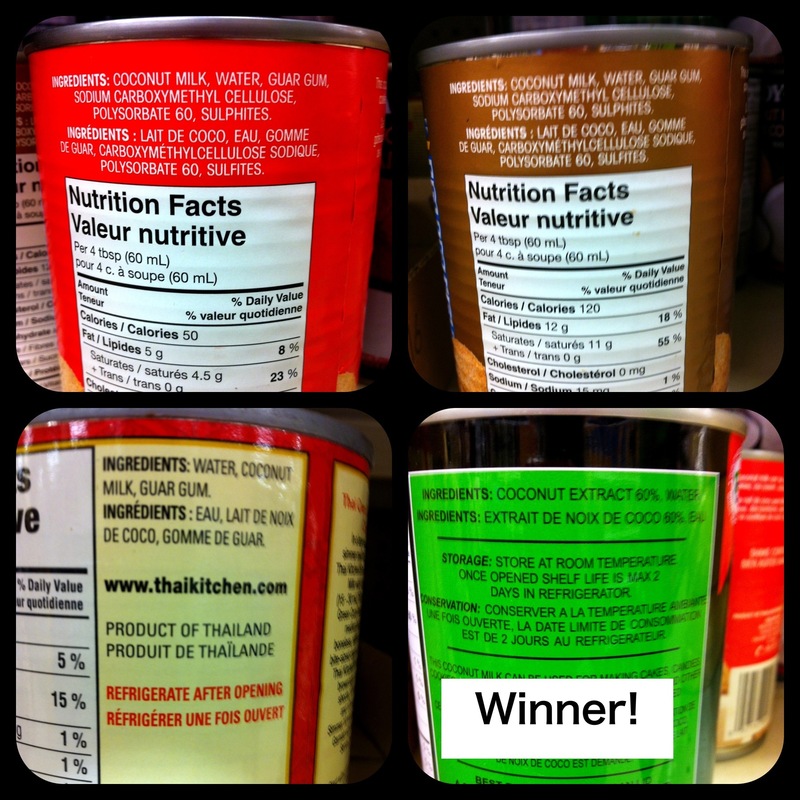 I had thought that the “light” coconut milk might have some weird stuff, in reality it was a little better than some of the others (see bottom left photo) and simply had more water than coconut milk. Tip: if you want “light” coconut milk, buy the regular stuff and water it down, save yourself some money! Exactly what are these added ingredients hiding in your coconut milk? Guar gum is a thickener made from a type of seed. It’s pretty common in foods, especially ice cream and it’s pretty harmless. Sodium carboxymethyl cellulose a synthesized thickener and stabilizer used in many foods. According to the Centre for Science in the Public Interest it’s safe. However, I also found this Material Safety Data Sheet that made me rather wary. Polysorbate 60 is an emulsifier and is also supposedly safe in foods. However, use in cosmetics is restricted. I don’t know about you, but I don’t really want to eat something that might not be safe for me to put on my skin. Sulphites are used to prevent discolourization in foods. They can be dangerous to those with a sensitivity, and to those suffering from asthma. While many of these additives are allegedly safe, to me that’s not the point. If I’m buying coconut milk I want coconut milk, not coconut milk and a bunch of other things to make it creamy and white. I’m perfectly capable of shaking the can before opening to emulsify it. Also, if you want to use the thick cream from the top of your coconut milk, you may be out of luck if it’s heavily emulsified and stabilized. Let this serve as a reminder to you to always read the ingredient lists on packaged foods, I know I will! Tags: coconut milk, emulsifiers, food additives, guar gum, label reading, polysorbate 60, sodium carboxymethyl cellulose, sulphites | Permalink. ARGH!!! I’m getting so frustrated trying to find foods without all of these nasty stabilizers!! Went to buy coconut milk and couldn’t find a single brand in my grocery store without guar gum, and guar gum gives me nasty migraines. Just went on a big old rant on my blog. What was your winning brand? Honestly, I can’t remember what brand it was anymore. I’ll see if I can locate it next time I’m at the grocery store and let you know! Coconut milk in fact is nothing more as natural coconut oils and fats dissolved in water. This situation is not stable as oils and fats donot stay in solution with water. Never. Impossible. Therefore additives are necessary, in this case emulsifiers together with stabilizers. Coconut Cream/milk without any additive is as scarce as hen’s teeth ! So, complain at your national food authority, FDA etc. as additives are NOT mentioned, as.. that is against all food laws on this planet. Yes, AROY-D and others are iswindling with their “marketign friednly”forgotten additives. Really? They don’t have to disclose that information? Certain additives aren’t required to be listed on packaging. I discovered this while researching polyethylene glycol, a.k.a. anti-freeze. Believe it or not, it’s in most commercial ice cream. And you’ll never see it listed on the ice cream package. (I’ve also found it in tiny tiny print in prescription drug inserts.) It’s part of what makes ice cream smooth, creamy and not hard as, well, ice. Check out: USDA reg 21 CFR 101.100 ~ deals with labeling exemptions dealing with incidental food additives. I imagine many countries have similar, though variable, exemptions. I used to use Arroy-D. One day I bought an organic coconut milk on sale…whoa! There was a fat glob floating in coconut water. Both cans listed the same ingredients. That’s when realized something was amiss. I’ve bought & tried other coconut milks with “no additives” & see broad differences. BTW: gently heating the glob/water emulsified the coconut milk. I knew about the polyethylene glycol. It seems to be listed on ingredient lists in Canada, from what I’ve seen. It’s very frustrating that manufacturers don’t have to include all ingredients on labels. It makes it difficult for consumers to make informed decisions. Thanks for commenting! 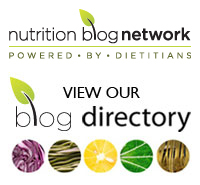 As if Dietitians know anything about actual nutrition, with their awful Food Pyramid advice. PUFAS, improperly prepared whole grains as a staple, and complete ignorance about the importance (yes, Importance) of saturated fat for health. That is what “Dietitian” licensing means. That’s not what dietitian licencing means. Dietitians are trained to think critically about nutrition and nutrition research and provide people with evidence-based advice. I’m sorry to hear that you have gotten such a negative impression of my profession. In an ideal world, I would agree it best to avoid such additives/substances as this, but the reality is that these substances are widely used and are deemed possibly safe. From what scientific evidence I can find for its potential of harm it would seem testing on animals proved that it was indeed harmful but only at dosages much higher than any product is allowed to contain. In small amounts, there is no evidence it does cause any harmful effects. You are probably breathing in far more dangerous chemicals on a daily basis. So yes, avoid where possible but don’t get your knickers in a twist if you happen to ingest a small amount every now and then as the likelihood of it doing any harm is relatively small. A study published in Nature Volume 519, 92–96 (05 March 2015) looked at two common emulsifiers–Polysorbate 90 and carboxymethylcellulose. These emulsifiers may upset good gut bacteria and unleash a host of problems. The authors assert ” the broad use of emulsifying agents might be contributing to an increased societal incidence of obesity/metabolic syndrome and other chronic inflammatory diseases.” Ouch! The (US) NCBI, Nat’l Center for Biotechnology Information–under the umbrella of the [US] Nat’l Institutes of Health and Forbes Magazine also have information about this study.